If you have a filet mignon recipe that you love but are looking to eat healthier, you just need to change those beef recipes into turkey mignon recipes. What is a Turkey Mignon? A turkey mignon is a 2-3 ounce portion of a turkey breast. They are cut from the larger part of the turkey breast. Some stores sell precut turkey medallions or you can ask your local butcher to portion them out for you. If you are cutting the turkey breasts yourself at home, start cutting at the large end of the turkey and make 1-inch thick slices. You can use the scraps for turkey soup, a fantastic way to start your turkey mignon dinner. The real difference between filet mignon recipes and turkey mignon recipes is that beef cooks differently than poultry. Beef cooks faster and is done at a lower temperature while turkey needs to cook to a higher temperature and will have a more defined flavor than a beef filet. With this in mind, you will need to cook a turkey version of your filet mignon recipe at at least 165. A basic turkey mignon recipe that is easy to make is the baked turkey mignon. Wrap one strip of bacon around each of the turkey medallions, securing it with a toothpick placed straight into the turkey. Lightly season the turkey on both sides with salt and pepper. Pour the oil into a medium sized pan and place over a medium heat. Once the oil is hot, about two minutes, place the turkey medallions into the pan and sear each side for about a minute. We are looking to get a bit of color and texture here, not cook it through. Place the turkey medallions onto a cookie sheet that has been lined with parchment paper. Place the turkey into your oven and bake for 15-20 minutes or until it reaches 165 degrees. While the turkey is cooking, place the butter into the pan and reduce the heat to medium low. Once the butter has melted, add the sliced mushrooms and a pinch of salt. Cook over a medium heat, stirring constantly until the mushrooms become soft. Add the wine and simmer until it's reduced by half. Once the turkey is done, remove from the oven and let rest for five minutes. Place one on each plate. You can add this topping to your turkey mignon recipes. Hold at room temperature or store in the refrigerator. Before serving the turkey medallions, place 2 tablespoons on the turkey and let the heat of the turkey melt the butter. 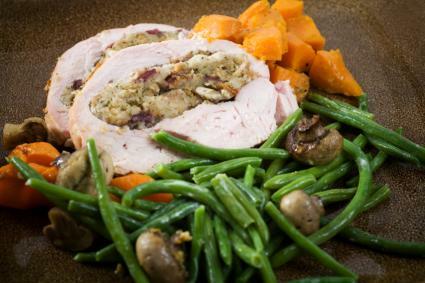 Although I always advise people to cook their stuffing separately from their turkey, when you are cooking a turkey mignon you can safely stuff the medallion with precooked stuffing. Using a paring knife, slice a pocket into the side of the turkey medallion. The best way to do this is to insert the knife into the medallion and, using the tip of the knife, slowly cut a pocket. Ideally, you want a small opening that would be easier to seal. This takes some practice, but once you get good at it you can use the same technique to stuff pork chops. Stuff the turkey medallion with the precooked stuffing. Bake the turkey medallions for 15 to 20 minutes or until the stuffing is cooked to 170 degrees.